Lauren Hughes is a senior Elementary, Special Education, Early Childhood Education major. 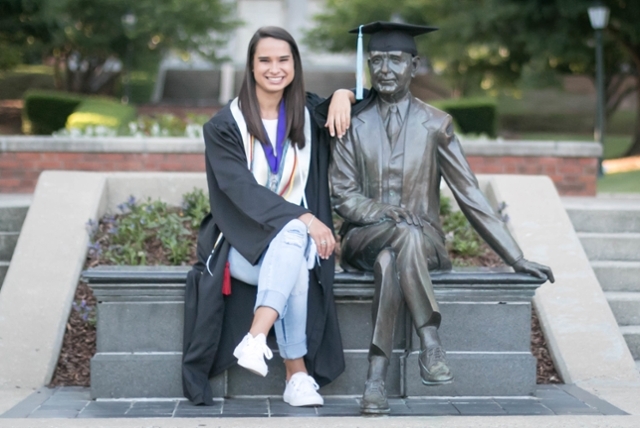 When she graduates May 13, she will earn Alabama teaching certificates in four areas: Early Childhood Education, Elementary Education, Early Childhood Special Education and Elementary Collaborative Teacher. Her professors describe her as a natural leader, encouraging of others, always prepared, willing to go the extra mile and outstanding in all ways. Lauren's passion for teaching and reaching all children is contagious," said Karen Birkenfeld, assistant professor and teacher education chair. "She has always served as a role model for her peers and underclassmen. I know she will do the same for her students." Hughes' other professors agree; collectively, they nominated her for the 2017 Dean’s Award which she received on May 4. Lauren embodies many of the values we seek to instill in our students," said Birkenfeld, "we are so proud of the work she has done inside and outside of the classroom." In addition to being an outstanding student and wonderful student teacher, Hughes spends much of her free time volunteering with Cornerstone Ranch, a non-profit Christian organization focused on helping young people grow spiritually through summer camps and weekend retreats. In 1997, four young men had a dream of a place where young people could have the opportunity to experience the outdoors and encounter the saving knowledge of Jesus Christ. In 2008, that dream became Cornerstone Ranch. When it was founded, the ranch was only holding weekend retreats but three summers ago Hughes helped orchestrate a summer camp opportunity. "My boyfriend, Dalton Moore and I were serving as praise and worship leaders for the weekend retreats and he shared with me his vision for a summer day camp," said Hughes. At the time, she was just a sophomore at Samford University but she worked with Moore to plan out the details and they presented their idea to the Cornerstone Ranch Board. This summer, the pair will lead the third annual summer camp series consisting of four camps, three in June and one in July. Camp activities include, devotion, arts and crafts zip lining, canoeing, fishing and adventure walks. "The walk is my favorite," said Hughes, "it is a half mile walk that ends at a cross. A lot of the kids will complain that it is hot or they are tired; it is a perfect opportunity to discuss the journey Jesus made to pay for our sins." Hughes says her Teacher Education classes at Samford have made a big impact on her work with the camp. "When a child steps into my classroom, I want their parents to know it is another home for them and I want my campers' parents to know the same thing," said Hughes, "Their child is more than just a camper or a student. We love them and we want to invest in them." Another way her education and passion for Cornerstone Ranch have merged is through classroom management and intentional curriculum planning. "The first year of camp, we just led a group devotion with campers, but because of my studies at Samford, I knew we could make it more beneficial by adding another piece," said Hughes. Studies show that students take away more when they have an interactive exercise, so Hughes suggested they combine art and devotion. "This way, campers take what they hear and put it into practice in their own way...I believe it helps them comprehend more," she said. According to Hughes, the Cornerstone Ranch team has a big vision for the future but "we have a big God." There are many ways to get involved with Cornerstone Ranch, donating, sending campers, volunteering but Hughes believes the biggest thing people can do is pray for the leadership team. "It's not just a camp where kids play all day, we really want to invest the campers spiritually," said Hughes, "hopefully you can feel that when you pull in and know it when you leave." During her time in college, Hughes says she has grown immensely and found her passion. "I love to teach and I love to watch my students grow. I am thankful for my time at Samford, for my professors and for God's constant provision." Hughes says she is grateful for her time at Samford and looks forward to what the future holds for her career. She was offered multiple teaching positions but after much deliberation she has accepted a position at an elementary school in Birmingham. She plans to spend nine months of the year in the classroom and her summers at Cornerstone Ranch. Hughes and Moore have a vision of jam packed summers with camps every week and camps where kids are able to spend the night out on the Ranch. "With Dalton's background of worship arts and adventure leadership and my background in education...I think the sky is the limit," said Hughes.